Carrie Fisher's one woman show, Wishful Drinking, is coming to the Roundabout Theatre Company this Sept. It's a limited run with previews starting Sept. 22 and an Oct. 4 opening running through Jan. 4, 2010. "Hollywood legend, Carrie Fisher's recounting of a true and intoxicating tale. It's not all sweetness and light sabers for the Star Wars princess as she battles addiction, depression, mental institutions and that awful hyperspace hairdo. 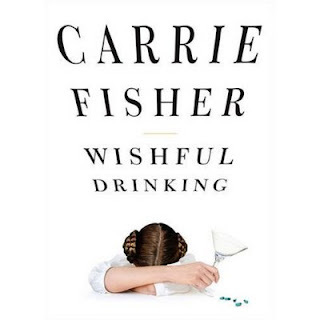 Carrie Fisher's Wishful Drinking is an uproarious look at Hollywood hangover!" I love the poster that the Roundabout is using. It's also the cover of Ms. Fisher's book. Loving her intro bit to Next To Normal in this year's Tony Awards, I'm very intrigued by this show.